If you ordered the Limited Deluxe edition of Raw Power, you should be receiving it shortly if not already! Let us know what you love the most about this awesome set and post your review or link to a youtube video review in the comments! Still haven’t ordered it? 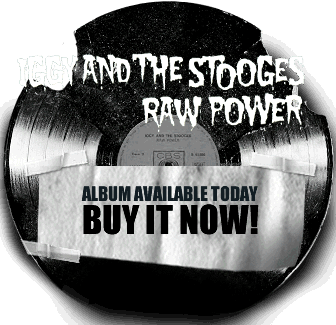 Get it exclusively at the Iggy and the Stooges store before the Raw Power runs out! Today, April 21st is Iggy’s birthday. Leave him a birthday wish in the comments of this news item. Enter to win a Raw Power Legacy Edition! Head on over to TheyWillRockYou.com to enter for your chance to win a Iggy and The Stooges Raw Power Legacy Edition. Iggy Pop sat down with “Nightline” at theWhisky Blue Bar in New York City to talk about the artists that influenced him. One of the all-time classic rock albums–Raw Power by Iggy and the Stooges–is being reissued this week with bonus tracks, a live show from Richards in Atlanta, October 1973. For those holding out and splurging for the Deluxe Edition, you’ll get a 4-disc package, including a DVD of the Making of the Record, with a special 48-page softcover book with an essay by Henry Rollins and testimonials from Lou Reed, Joan Jett, Tom Morello and others explaining how you, too, can lose lose weight listening to this fine album. Here’s my simple 10-step reasoning why you should be listening to this album today. It was their first of four dates in France last night. The explosive Iggy Pop and the Stooges made a bright and noisy comeback in Quimper, yesterday. At the expo park, the iguana has ignited the festival audience, come mostly for him. In their forties and looking forward to see or review the idol of their youth. But also very young, who at 15 years, know by heart the lyrics of the Stooges. Surprising! The songs he sings? Those of the mythical album Raw Power and No Fun. When he sings the opening bars of “I Want to Be Your Dog” (I want to be your dog), almost on all fours on stage, the microphone between his teeth like a bone, it’s madness in the room. 4-part podcast series about Iggy and The Stooges Raw Power is now live at http://podcasts.legacyrecordings.com/iggy with new episodes every Tuesday in April. Welcome to the NEW Iggy and The Stooges music website. A select number of Iggy Pop t-shirts have been made available for fans. 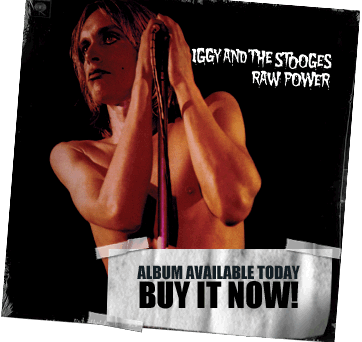 The Raw Power (Deluxe Edition) by Iggy And The Stooges becomes available on APRIL 27th. · The long out-of-print original David Bowie mix of the album, newly-remastered for maximum impact! · A full disc of Rarities, Outtakes, & Alternates from the Raw Power Era. · 48 page softcover book with essays by Henry Rollins, Brian J. Bowe and Kris Needs + testimonials by Tom Morello, Lou Reed, Cheetah Chrome, Jim Reid, Perry Farrell, Hugo Burnham and more. · A TON of previously unseen Raw Power-era shots. · 5 exquisite 5×7-inch prints, suitable for framing. · The “Making of Raw Power” documentary by Morgan Neville featuring NEW interviews with Iggy Pop, James Williamson, Scott Asheton, Mike Watt, Johnny Marr, and Henry Rollins; plus live performance footage of James Williamson’s first reunion gig with Iggy and the Stooges – after 35 years! – shot at Festival Planeta Terra, S‹o Paulo, Brazil, November 2009.